More information about the New Orleans Saints 2013 Wall Calendar. 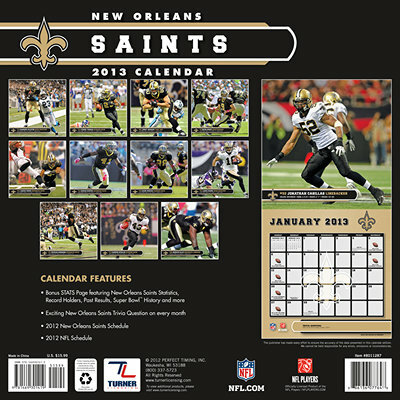 "New Orleans Saints Wall Calendar: Specially designed for the die-hard New Orleans Saints fan, Turner Licensing presents the ultimate 2013 NFL wall calendar! Your favorite players are displayed in vivid action-packed images along with player bios, team trivia and noteworthy NFL historical dates every month. And it gets better: a ""Pro-STATS"" page is included featuring team stats and past results, and the 2012 2013 Saints season schedule is presented along with the bonus months of September through December 2012. The spacious calendar grid lists major U.S., Canadian, and religious holidays while also providing a convenient glance at the dates of the preceding and succeeding month. This calendar is an absolute must-have for football fans! ISBN: 1469301415 UPC: 886136077648"